Our first big comic book gig was with the fine folks at Kenzer and Company drawing the spin-off comic book Knights of the Dinner Table: Illustrated (K.ILL). As the regular KoDT: The Magazine deals with the characters sitting around the table playing the role-playing game HackMaster, K.Ill focused on the adventures in the RPG world of characters Knuckles, Teflon Billy, El Ravager and Zayre. 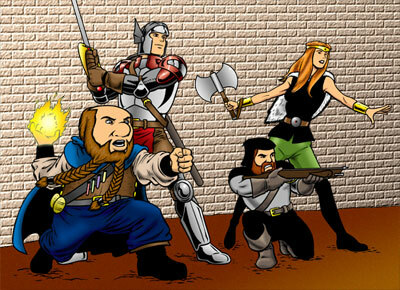 The series stared as retelling of the classic KoDT misadventures, but as the series progressed, we introduced new adventures and new characters. The series also began as a bimonthly, but soon turned to monthly. Though we didn’t start on the series until issue #4, we drew every issue after that until the final issue #41. We have nothing but fond memories of working on this series, as it was our first big break in the industry. It’s also interesting to look back at issues of the series and not remember a sequence or event (well, it was about 15 years ago!) that we drew.